Kate Middleton's Trooping the Colour outfit may have been inspired by this royal | HELLO! The Duchess of Cambridge and Princess Madeleine of Sweden have a lot of things in common; both royals are 34 and raising two young children in the public eye, and now it appears they are fans of the same fashion designers too. Royal fans have noticed that Kate's head-turning outfit from Saturday's Trooping the Colour celebrations was remarkably similar to one worn by Madeleine just a few weeks ago, when she celebrated King Carl XVI Gustav's 70th birthday at Sweden's royal palace. Like Kate, Madeleine wore an Alexander McQueen coat for the royal festivities, but she opted for a dusky pink cover up as opposed to the chic cream coat that Kate wears. Madeleine and Kate completed their looks with remarkably similar hats from milliner Philip Treacy. Both featured the same tilted design with a beautiful flower corsage, but Madeleine's headpiece was black with a contrasting gauze trim while Kate's was cream to co-ordinate with the rest of her outfit. Rather than wear her glossy locks down like Madeleine, Kate kept her locks in a chic chignon and accessorised with a pair of Balenciaga £415 faux pearl earrings which have a magnetic back. 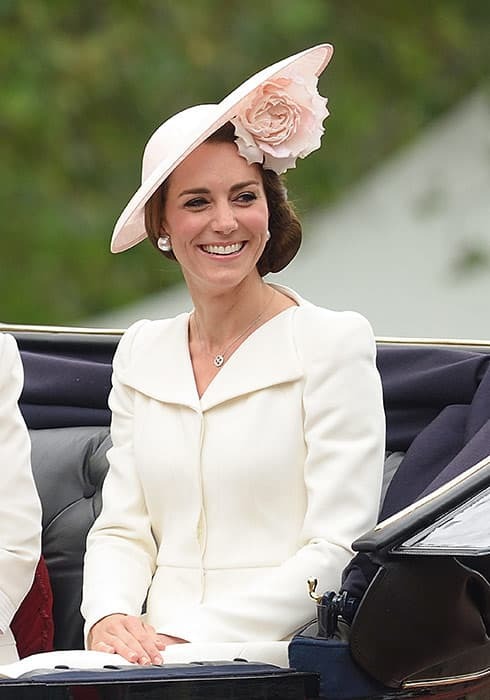 They added a high fashion finishing touch to her outfit, as did her favourite Mappin & Webb Empress mini necklace, which she has been spotted wearing on several occasions. Kate is often compared to other European royals, particularly Crown Princess Mary of Denmark. While the pair share a similar dress sense, a glimpse inside their homes has revealed they share similar interior design tastes, too.